One message that could come from this Sunday'sreadings is, "We are our brothers' and sisters' keeper". Our readings today focus on our God given responsibility to care for and correct one another, in a spirit of love. In our first reading (Ezekiel 33:7-9), God appoints the prophet Ezekiel to be watchman for the people of Israel. God holds him personally responsible if he does not warn the people of their evil ways. God calls Ezekiel "son of man", a term of humility that Jesus often used to describe himself. Thus says the LORD: You, son of man, I have appointed watchman for the house of Israel; when you hear me say anything, you shall warn them for me. If I tell the wicked, "O wicked one, you shall surely die, " and you do not speak out to dissuade the wicked from his way, the wicked shall die for his guilt, but I will hold you responsible for his death. But if you warn the wicked, trying to turn him from his way, and he refuses to turn from his way, he shall die for his guilt, but you shall save yourself. In our Gospel reading (Matthew 18:15-20), Jesus lays out the proper order of reconciliation back into the Church for someone who has fallen. First, one-on-one, then with a few, and if still unsuccessful, with the whole Church. As in the first reading, the goal is reconciliation, not condemnation. Then, Jesus gives his disciples the power to reconcile sinners. Jesus said to his disciples: "If your brother sins against you, go and tell him his fault between you and him alone. If he listens to you, you have won over your brother. If he does not listen, take one or two others along with you, so that 'every fact may be established on the testimony of two or three witnesses.' If he refuses to listen to them, tell the church. If he refuses to listen even to the church, then treat him as you would a Gentile or a tax collector. 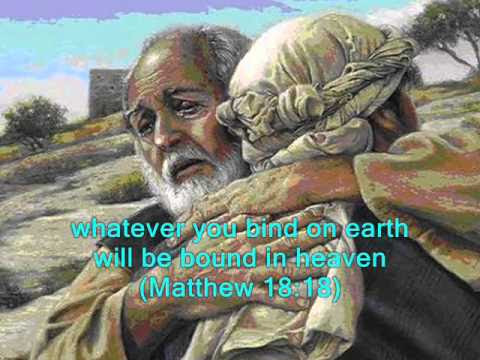 Amen, I say to you, whatever you bind on earth shall be bound in heaven, and whatever you loose on earth shall be loosed in heaven. Again, amen, I say to you, if two of you agree on earth about anything for which they are to pray, it shall be granted to them by my heavenly Father. For where two or three are gathered together in my name, there am I in the midst of them." In our Epistle reading (Romans 13:8-10), St. Paul continues his exhortation of last week to "offer your bodies as a living sacrifice" by telling us how - - to live in love. He reminds us that all violations of the law have at their root a failure to love one another. It is this love that drives our desire for reconciliation and concern for each other. Brothers and sisters: Owe nothing to anyone, except to love one another; for the one who loves another as fulfilled the law. The commandments, "You shall not commit adultery; you shall not kill; you shall not steal; you shall not covet, " and whatever other commandment there may be, are summed up in this saying, namely, "You shall love your neighbor as yourself." Love does no evil to the neighbor; hence, love is the fulfillment of the law. How often do we judge others' wrongdoing out of a sense of superiority or self-righteousness? The duty to correct must be borne out of love, not judgement, and done as privately as possible.